Feeling a little better – only a little – but I am certainly feeling better than I felt this morning, when I felt awful. Lots of rest. Lots of ginger and decaf tea. 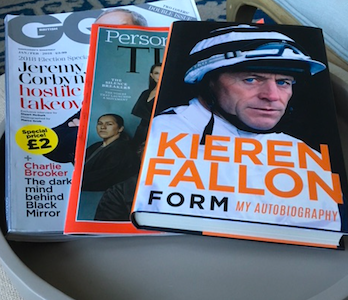 Lots of perusing periodicals, newspapers and Kieren Fallon’s autobiography. No attending Christmas lunch with my lovely colleagues at Lexington North – which was not pleasing. Still feeling sore, tired and generally off form. More rest, reading, tea and tablets for my tummy to follow. This is not an exciting post!